Justin Wright is not your average basketball fanatic. Where others stand and scream, he scrubs and sweeps. They paint their faces; he paints the hallways. They show up early for tickets; he stays late for toilets. You might call him the janitor. But ESPN calls him one of the top 10 fans in the world. Wright, a custodian at Assembly Hall, is a finalist in ESPN’s Hall of Fans competition. On www.thehalloffans.com, readers can vote for the world’s best sports fan. Wright is one of 10 finalists chosen from more than 10,000 entries. But unlike his competition, Wright doesn’t just support his team — he works for it. 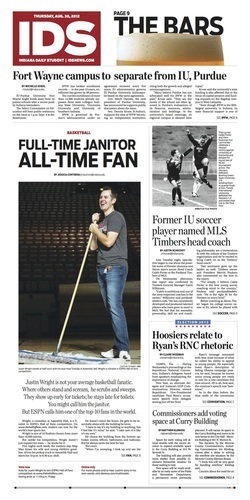 Five nights each week, the modern-day Mop Man kisses his wife and young children goodbye, drives his pickup truck to Assembly Hall and starts his 10 p.m. to 6:30 a.m. shift. He doesn’t mind the hours. He gets to be essentially alone with the building he loves. 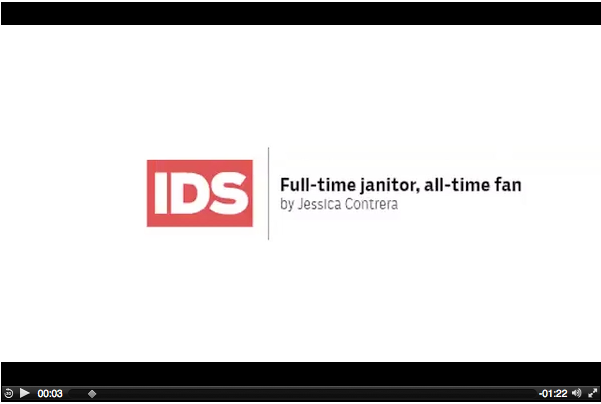 He cleans the building from the bottom up: locker rooms, offices, bathrooms and hallways. But he always saves the best for last. Although 29-year-old Wright grew up just minutes from Assembly Hall, he only witnessed “all that happened” on television. Wright’s great-grandmother, who raised him, could never afford to take him to games. Still, Wright credits her for instilling his love of IU athletics. Today, Wright is known for how hard he works to support those players and coaches, said Bob Gilmore, custodial supervisor of IU athletics. For Wright to win, he has to be in the top three of the 10 finalists. If he wins, he’ll be inducted into the Hall of Fans on ESPN’s Connecticut campus and featured in ESPN The Magazine. He’ll also receive $500 and an all-expense-paid trip to New York. Wright has never been to New York. He said if he wins, he’ll use the trip to celebrate his seven-year anniversary with his wife, Christa. He’s also aching to share the spotlight. But no matter the results, Wright said, he’ll still be loyal to IU basketball and Assembly Hall. A month from now, he’ll be back to the same routine. “Yeah, I’m cleaning toilets and doing some nasty stuff, but I love it here. I’m not going anywhere,” he said.